Galina Shlezinger is Strauss' coffee plant quality manager. 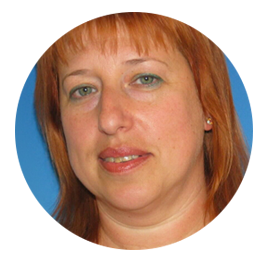 Galina has worked at the company for over 20 years, making up for almost her entire life in Israel, since emigrating from Leningrad, where she worked as a chemist after graduating Saint Petersburg's science institution, majoring in technologicalical engineering. In Israel, Galina graduated numerous courses in the field of food science at the Hebrew University's agriculture faculty. She takes special interest in the area of organoleptic greatly important in the coffee quality control process. In her opinion, despite welcomed progress, no machine has yet to give us a qualitative description of coffee like a human can, a fact that magnifies the importance of a manual tasting & smelling. She lives in Beit Shemesh, Israel, with her husband and three kids.